Chef Gordon Ramsay is famous for his over-the-top antics in the kitchen for his reality cooking television shows. He is an exceptionally gifted and inventive chef, which this recipe proves. Chef Ramsay's take on a holiday side dish gets a brilliant spin with his caramelizing sugar before adding it to the cranberries. The result is a traditional fruit compote with a wonderful caramel flavor. You'll love this recipe for any holiday meal, especially as a side dish for roast turkey, goose or duck. Turn the heat to medium-high, and quickly whisk the water and corn syrup into the sugar, as it begins to melt. Swirl the pan to make sure the sugar dissolves evenly, but don't whisk or stir. As the sugar melts, and the liquid boils off, it will begin to turn a pale amber. Move the saucepan around so the sugar cooks evenly and doesn't burn. When the caramel is golden brown, add the cranberries, swirling them in the caramel. (The caramel is very hot, so be careful.) 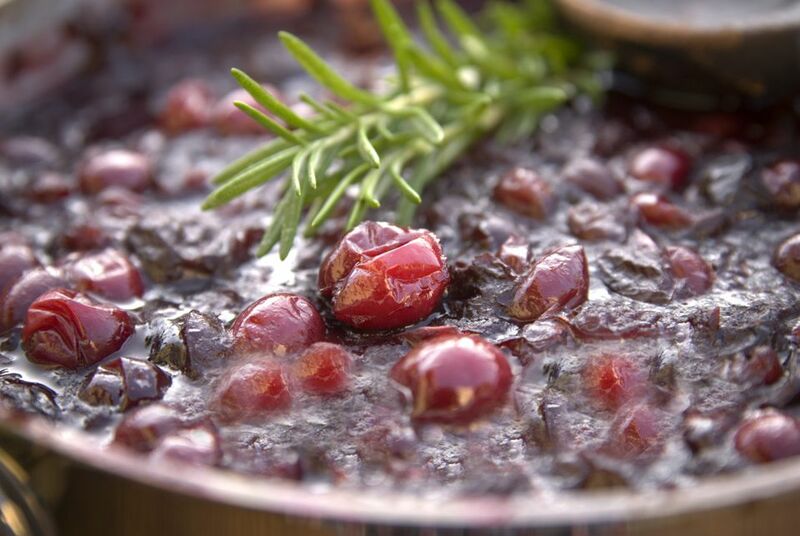 When the cranberries begin to burst, add the apple, then sprinkle with a pinch of salt and a few grinds of pepper. Take the saucepan off the heat, and pour the port around the sides of the pan to deglaze the caramelized bits stuck to the pan. Quickly swirl the compote with a wooden spoon or plastic spatula to incorporate. Add the orange zest and orange juice. Put the saucepan back on the stove top, lower heat, and simmer 5 to 10 minutes to thicken. The compote will thicken when cooled, so try not to overcook it. Transfer to a heat-resistant glass bowl and cool to room temperature, then cover and chill. The compote can be prepared two days ahead and will taste better as all the flavors meld. When ready to serve, remove the compote from the refrigerator 1 hour before. Serve with roast turkey, goose or duck.